You save a lot on beauty and personal care section with the BOGO Deals and coupon savings. Earn rewards with certain purchases at Walgreens stores this week. 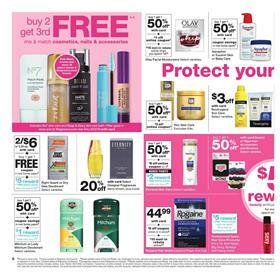 Fragrance, makeup items, deodorant, skin care, fragrance are in the beauty section of the latest Walgreens Ad Preview. The deals will be effective on Mar 10 - 16. Buy 2 Get 3rd cosmetics, nails & accessories for free! Coupon discount on Schwarzkopf, Nivea lotions, Aussie or Herbal Essences hair care, and more products. Walgreens is a wonderful place. Battle with cancer in a beautiful way with style. Walgreens as a page just for you. Makeup products and the changes you need can be your source of happiness during your challenges. You can also find personal care products such as Oral-B or Crest dental products, Colgate toothpaste, Zzzquil sleep aids, Smoking cessation will be BOGO 50% off deal. - Edge or skintimate shave gel will be a coupon deal next week. - Get your prescriptions at Walgreens within seconds via Walgreens app. - Check out all important beauty products below the list or go to pg 7-9. 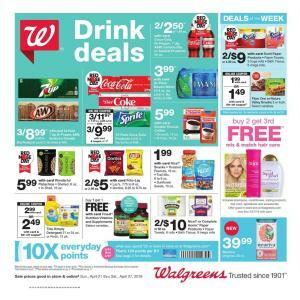 Diet Coke, Pepsi products, General Mills cereal, M&M's and many more products of candies, chocolate bars, pizza, breakfast foods, and Easter treats are available on Walgreens Weekly Ad Snack sale. BOGO 50% off deal is valid on candies. Coupon savings like Hershey's or Cadbury Easter candy, Dove or Mars minis or Easter eggs are also available discounts. BOGO Free Finest Nutrition vitamins and supplements, Nature's bounty and many more brands this week. 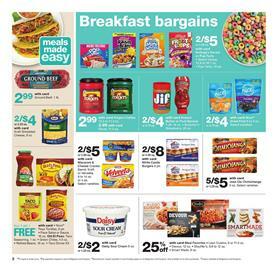 Restock your snacks with the low prices from Walgreens Ad. 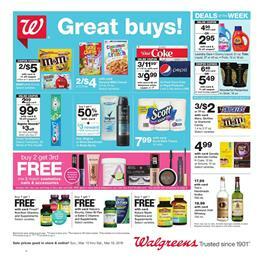 You can find weekly deals on Walgreens Ad category here. Subscribe to get regular emails from the updates. Among the great deals of the pharmacy and grocery, there are breakfast foods like General Mills cereal. Lucky Charms and Cinnamon Toast Crunch are two great products from the breakfast category. Buy your coffee at Walgreens for only $4.99 that is the price for Maxwell House coffee of 30.6 oz. pack. You have also deals on Maxwell House instant coffee 8 oz. priced at $2.99! Early Easter deals are available at Walgreens. Buy Easter Candy or chocolate, stuffed animals, Bubble toys, and save with coupons on Easter products on pg 5. Follow our Facebook page where we share the updates of these posts. You can also subscribe to the category page to get emails. $5 reward for your $50 purchase on beauty products at Walgreens next week. Shop L'Oreal preference, Garnier nutrisse, Olia hair colour, Tresemme hair colour, Garnier whole blends shampoo, and more products are participating items to the reward deal. Shop razors of BIC, Pure silk, Barbasol, Gillette on pg 18. BIC razors will be BOGO 50% off and it'll be $3 reward wyb 2. Spring is coming soon. You might want to stock up some sun care or skin care products from top brands. 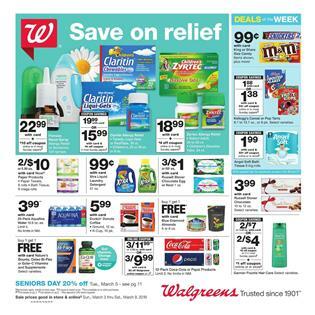 You have a lot of deals on pg 19 of the Walgreens Weekly Ad Mar 3 - 9. BOGO free deals and multiple-buy sales will be your options to save on Aveeno, Neutrogena, Garnier, Jergens, and more brands. Designer fragrances will cost $10 cheaper this week at Walgreens. Australian gold sun care is a BOGO 50% off deal. 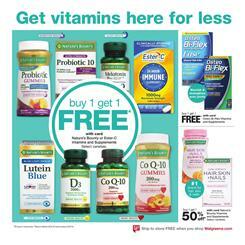 Get your vitamins with BOGO Free deals at Walgreens stores. The latest vitamin deals are the BOGO Free sales from the pharmacy section of Walgreens Weekly Ad Preview. Nature's Bounty, Ester-C are two major vitamin brands which are BOGO Free deals. Moreover, Osteo Bi-flex and Nature's Bounty are BOGO deals, too. Save more with coupons on some products. One of the coupon deals is $3 discount on One A Day or Flinstones vitamins and supplements. Walgreens Ad Preview shows more coupons like that. Another BOGO Free deal is valid for the same brand vitamins. Finest Nutrition, Nature Made, Walgreens brand vitamins are BOGO Free if you buy 2 products of the same brand. It's a profitable trade with Walgreens. Besides, you will be supporting children who are in need when you purchase vitamins at shoppable places of Walgreens. Majority of the health care section is about these but you can also find elder care, feminine care, reward deals on pg 14. Pain and allergy relievers, sleeping pills, and other popular health-care items from brands like Tylenol, Zyrtec, Aleve are available on pg 15-16. Deals of the week are Snickers, M&M's, Kellogg's frosted flakes, Foot loops, and Angel Soft bath tissue! Coupon savings are available for many products this week. Use the online coupon to save on Coca-Cola or Pepsi products. Reduce the price by $2 and buy Coca-Cola, Pepsi 12-pack for only $9.99/3. Breakfast sale contains such corn flakes, cereals of Kellogg's. Visit pg 2 for loops. It's a pretty popular product of breakfast aisle right now. Shop Folgers coffee, Jif, Nice!, and more breakfast foods on pg 2. Multiple-buys will return as savings. Easy meals selection is also an interesting part of the Walgreens Ads. Save 25% on meal favorites including lean cuisine, devour, smart made on pg 2. Daisy sour cream will cost only $2/2! Go to pg 4 for soda, snacks, coffee, honey, and more products. Sometimes, you got no time for breakfast and even a single bottle of drink is enough for the beginning of a day. Check out tasty drinks on pg 4 that are perfect for dinners, too. More snacks are available on pg 5.